This is a re-posting of an article written in March 2011. Read some of the individual stories here. On September 16, 2010, Triangle Beagle Rescue Applications Coordinator Dan Savarese, was contacted by a group assigned to rescue animals from the PLRS Laboratory in Corapeake, North Carolina, following an undercover PETA investigation. Dan quickly asked for volunteers to accompany him to Corapeake the following day and to foster the dogs. By 9:00 the next morning, with 19 arrangements for foster placement, a group of 15 TBR volunteers, including Karen Carlton, set off to the Corapeake laboratory. and we talked on our cell phones. The weekend before the Corapeake rescue, the Triangle Beagle Rescue board of directors asked me to be the PR coordinator. I agreed, thinking I would do a few flyers and keep the Facebook page up to date. instructed not to exit our vehicles, take pictures, talk on cell phones or speak to the lab staff. We began to suspect how long this might take. About 30 minutes later, the first beagles emerged from the building. All of the rescue workers cheered from across the street, standing on tiptoe to get a better look at the dogs. Some of the dogs dropped to their bellies and crawled as soon as they hit the unfamiliar surface of the parking lot; they looked shy and confused. the long journey. They smelled of urine and feces and it seemed like Route 158 was the longest, darkest, most winding highway in all of North Carolina that evening. My group arrived at Sunny Acres Pet Resort in Durham at 11:45 p.m. Owners Donna and Don Easterlin and their staff were prepared and ready to help. Some dogs went home with their foster families that night, and Sunny Acres hosted the 22 remaining dogs overnight. The following day they bathed and prepared the dogs for the next part of their journey. days, as did many of the Corapeake beagles. She was adorable and sweet and, surprisingly, it didn’t take long for her to start playing with her foster sisters. Most of the beagles were shy and skittish, in varying degrees. The two I fostered, Cindy Lou Who and Buffy, were less shy and quicker to trust humans than some of the others. The males seemed to be in better emotional shape than the females. There were house training issues and escape issues with the dogs, so TBR adopted a set of safety guidelines for fosters and adopters, issued harnesses and leash couplers and provided training support with a behaviorist for the remaining dogs. 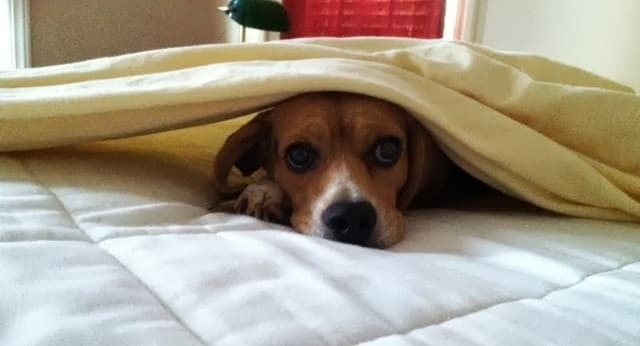 In addition to transporting 35 beagles and finding fosters for 19 of them in two days, a Triangle Beagle Rescue Web-based plea raised $10,000 to cover the rescue expense in six weeks. At the time of this article, four Corapeake beagles are still available for adoption: Gilligan, Joey, Izzy and Cindy Lou Who.